Your blouse is very beautiful! I've got tired of snow and Winter as well. Can't wait for Spring to arrive! OMYGOSH! Give me your bracelet, it is so damn perfect! 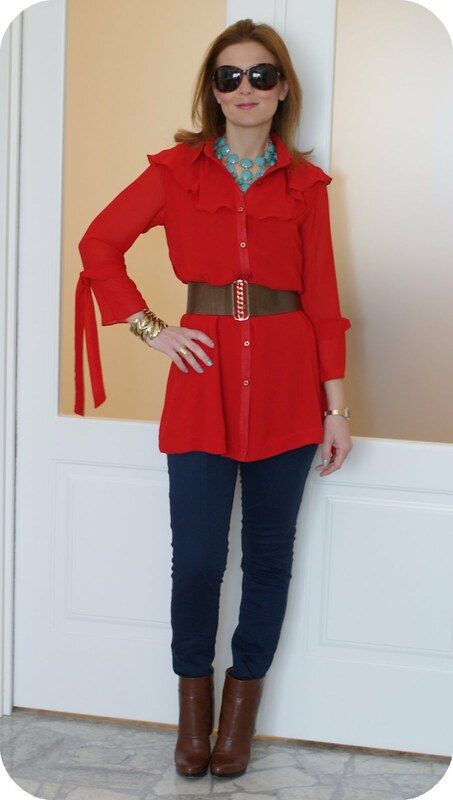 I loved this red blouse, really cute! Rosso e jeans ...una coppia collaudata e sicura! Che bell' outfit!E' vero,i sogni infondo è gratis e fa sempre bene!! 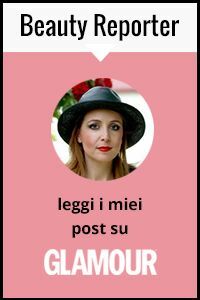 Ti aspetto presto nel mio blog,ho appena terminato un post ^^ Baci C.
I love your blog! I'm definitely following you now! hope you can do the same for me too! thanks! i like very much your style :) i'll follow u on fb and your blog! camicia, cintura e collana SPLENDIDI!!! this outfit is so lovely! great colors. the red is gorgeous, and I love the details of the top! You are gorgeous in red!! Love the leaves bracelet too! 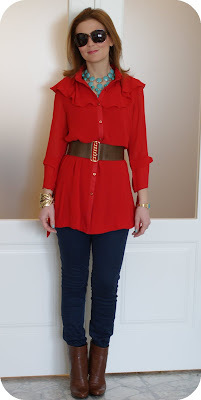 I like the red shirt but I love the necklace! Bellissimo cappottino rosso! :) E anche il bracciale è strabello! Thanks for your lovely comment!! I love that look, those boots are amazing!!! I´m your new follower!! Hi thaks for your comment! of course i follow you, also on Facebook and bloglovin ;) so i'll wait you do the same! Kisses and great blog!! i love these oufit!! We appreciate so much your lovely comment in our blog!!! Hi Vale,how are you? thank you so much for the lovely comments you left on my blog. 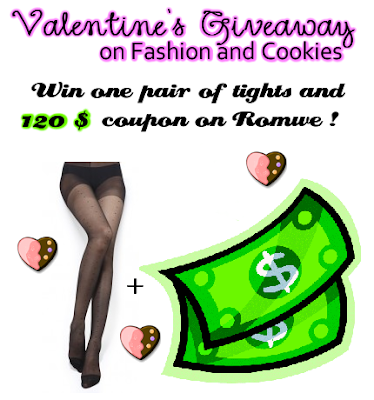 Sure to keep my eye on for the giveaways.again Kisses,Kaushi. Thanks for the comment on my blog! You look beautiful in this outfit...love the statement necklace! Qué collar tan bonito, es una preciosidad!!!! Y que bien te queda el rojo!!!!! Vas guapísima!!!! anche a me piace uscire il fine settimana e incontrare gli amici,ma purtroppo per via del lavoro non succede più spesso come una volta. Cmq prima o poi la neve finirà e tu potrai tornare alla tua solita vita :) anche io attendo la primavera! I really love your belt - it pulls everything together! Loved the bracelet and the Casio watch! Love the RED! 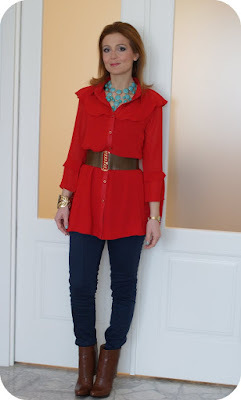 Such a fun bright color for these dreary winter months! Non me ne parlare, sono due settimane che sono chiusa in casa a causa della neve.... Mi sta salendo una forma pesante di pazzia..
Bello il tuo outfit, mi piace l'abbinamento rosso-turchese! I love your necklace. Kisses. Red looks great on you ! Such a chic outfit !! You look fantastic in red and I love your hair color!! I follow you cause I love your blog!! Great outfit! The red blouse is gorgeous! love the outfit! looks great on you! You look gorgeous, lovely colour on you! i visited romwe what you said. i really wish your on-line business going well. I will follow you. I like your blog. 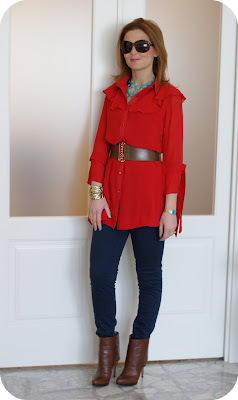 That red jacket with that turquoise necklace is gorgeous! Grazie per avermi avvertito, purtroppo non ho fatto in tempo, sarà per la prossima :) Un bacione ! Ehh siamo due sognatrici, già pensiamo alla primavera! Hai proprio ragione: non ne possiamo più di questo freddo! L'outfit è carinissimo.. spero tu possa indossarlo fuori all'aria aperta al più presto! You look fabulous in red, great colour for you to wear. exquisite outfit! 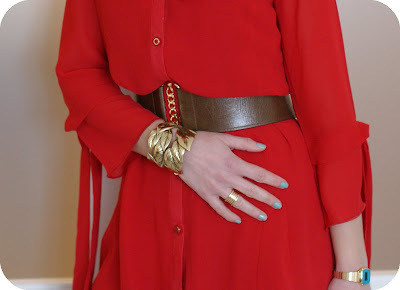 i like how you paired the red cape with the turquoise necklace, & the gold accented belt. 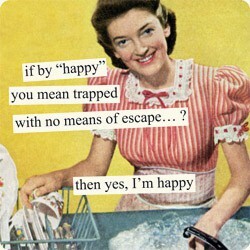 funny pinterest quote. it's just like life. I love your whole look, that red looks great on you!